Linda here sharing a card created using the divine Roses and Thorns die set. 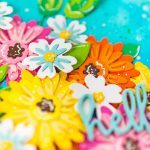 If you are a rose lover, you will LOVE the possibilities with these divine dies – you can give flowers everyday to those you love and they will last forever – being a treasure from the heart. 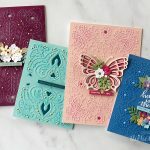 Cut/emboss both Roses and Thorns Die #4 and #5 (the smallest die size is #1) with sage cardstock, using the Grand Calibur Machine. 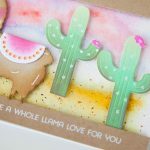 Use the Dies as Stencils and sponge using Rosebud Ink and a sponge dauber before removing from the Dies. Trim the Rose Corners and layer the Rose Corners using Foam Tape. Adhere the small roses using liquid glue. Score one rectangle at 1.5cm. Fold Forward and adhere double sided tape to the folded strip. Adhere Resplendent Rectangle Die #4 to the card base using double sided tape. 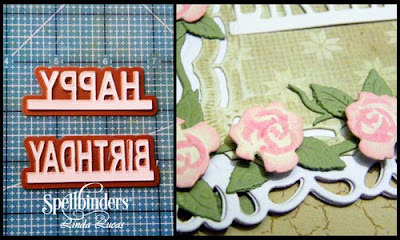 Adhere Roses and Thorns< die cuts to the layered card base using liquid glue. Cut/emboss one (1) Bordered Sentiments. Adhere to the small roses where desired. Designer Tip: Cutting different colors for the Rose Corners and small roses gives so many options for any projects – it can be matched to the patterned paper or coordinate with another feature.